Yep…you’re scared of them and you’re not alone. Although spiders and other insects are helpful in the way that they munch on other small pests, 81% of men, 80% of women and 99.9% of children have a fear of them. I’m guessing you don’t like them either, as your heart is racing and you’re reading this! These eight-leg arachnids can be found throughout the entire world; except for Antarctica. Unless you are ready to pack your things and move to a much colder climate, be prepared to encounter a variety of these guys in our region. Did you know that they typically have four (or three) sets of eyes and are near-sighted? Be careful, if you throw a shoe at one of the bigger ones, they’ll throw it back at you! Just kidding but we are sure you have encountered spiders large enough that make you wonder if you need to bring in the big guns…us! How did I get them? 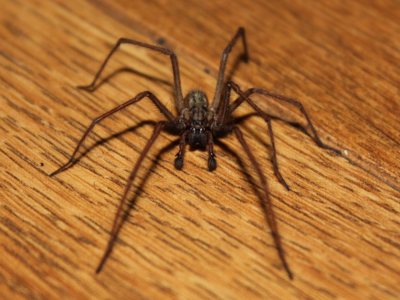 Spiders can be typically found in moisture prone areas such as basements, crawl spaces, water moisture issue areas. On the other hand, they can also be found in dry, warm areas. If you find a spider though, rest assured there is a food (other pests!) or water source there for them nearby. What can I do to help the situation? Keep the interior and exterior of the home neat and tidy. Trim back bushes and trees away from the home, and make sure clutter is removed on a regular basis as these are areas in which they tend to hide. Eliminate moisture in the home with the use of a dehumidifier. Clean up any cobwebs with a broom or vacuum. Is the treatment safe? Yes. It is also safe for children and pets. The treatment is not airborne, and once it is dry, it is only transferable to the insect. It is colorless and odorless. This same treatment is used at hospitals, daycare centers, restaurants, etc…you get the idea. I’d really rather not have them, so how do I get rid of these things? Eco Elite Pest Control will help. Our treatment involves the latest in training, equipment and products designed to get your life back to normal as well as any other contributing factors. The nice perk to our spider treatment is that it just doesn’t just take care of the spiders. The treatment will control many other crawling insects which can also be a main food source to those spiders you have an issue with! Our fully trained and Experienced Technicians will not only perform a Spider and general pest Control service to treat the problem inside but will also apply a preventative barrier outside but will also advise you on contributing factors and long term solutions to keep your home protected and spider free! Give us a call, text or you can email 24/7! After a chat with one of our friendly experienced office personnel regarding our Insect Control, you will be armed with information, an estimate and if you wish, service out to your home in a jiffy! With Eco Elite Pest Control on your side, your life will get back to normal…fearless.